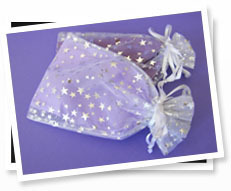 Each item purchased at indigostar.ca is gift wrapped in our signature star organza gift bags, and then securely packaged for shipping. This complimentary service is our way of saying “thank you” for your business. Each handmade jewellery piece is made to order in our North Vancouver, BC studio and orders are generally shipped out in 5 business days, unless the item you have ordered is currently out of stock. Please email us at info@indigostar.ca if you require your order to be shipped quicker. All prices are in Canadian dollars. The exchange rate will be the daily rate charged by your credit card company. The average necklace is 16 inches long. The average bracelet is 7 ½ inches long. To determine your ideal bracelet size, take a string and loosely wrap it around your wrist, adding a ½ inch for comfort. Your jewelry is guaranteed under normal wear and tear for three months from purchase. After three months, your jewelry will be repaired for a nominal fee. Indigo Star reserves the right to determine normal wear and tear. If you should require a piece to be repaired, please email us at info@indigostar.ca before shipping. We stand behind the quality of our merchandise. If for any reason you are not satisfied with your jewellery item(s), we accept returns of unworn, undamaged, originally tagged merchandise (with the exception of earrings and custom orders) for a full refund within 14 days. The merchandise must be accompanied by your original indigostar.ca sales receipt. All returns of merchandise purchased on this website require prior authorization. Please email customerservice@indigostar.ca to obtain a Return Authorization before returning. Shipping charges are non-refundable. We suggest you insure your parcel, as Indigo Star cannot be responsible for returned merchandise prior to receipt. Refunds will be credited back to the original method of payment. A credit will post to your account approximately two days after the date of processing. It may take up to two billing cycles for the credit to appear on your monthly credit card statement. Order cancellations are subject to a $10.00 restocking fee. We accept Visa, Mastercard and American Express. You can shop on indigostar.ca with the safety of our 100% secure shopping cart. Canadian residents will be charged 5% GST. All British Columbia residents will be charged 7% provincial sales tax plus 5% GST. The easiest way to care for your Indigo Star handmade jewelry is to keep it clean and stored in an air-tight environment (Ziploc bags work great). To safely and effectively clean your jewelry, place a sheet of aluminum foil (shiny side up) in a large glass dish. Spread the jewellery out in the dish, making sure the pieces are not overlapping each other. Pour about one inch of boiling water on top of the jewelry and immediately sprinkle two heaping tablespoons of baking soda over the boiling water. Leave the jewellery in the soda water for approximately five minutes. Remove, rinse well under cool water, and dry with a soft cloth. You may repeat this process, if needed, until your Indigo Star piece is bright and shiny. This non-toxic cleaning method is safe for all of our handcrafted jewelry.